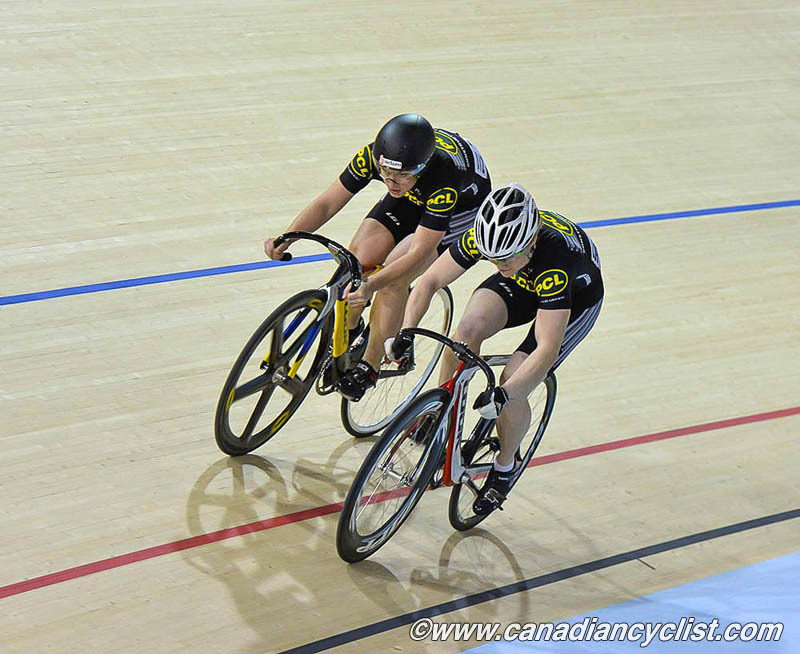 The sprint competition dominated Day 2 of the Canadian National Track Championships, at the new Mattamy National Cycling Centre velodrome in Milton, Ontario. Alberta's Monique Sullivan of Team PCL and Hugo Barrette of Equipe de Quebec won the elite women's and men's sprint competitions, respectively. 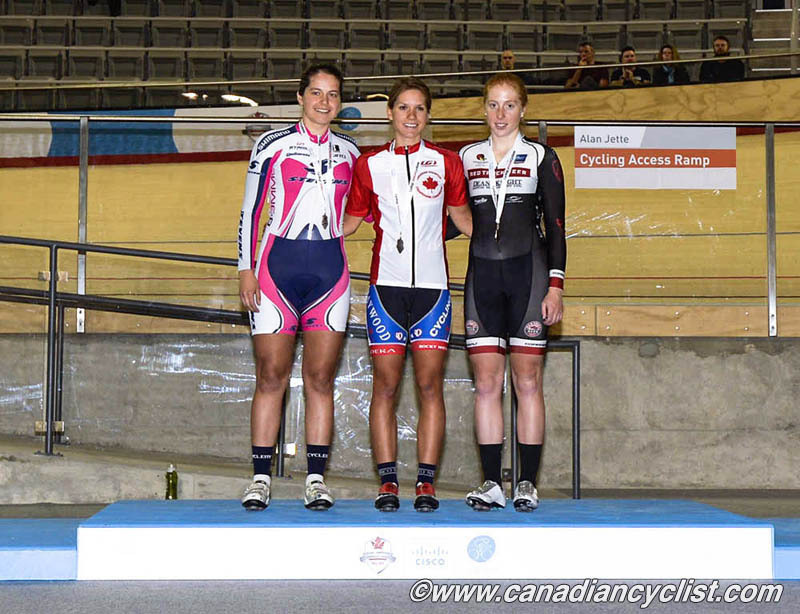 National titles were also awarded in the Individual Pursuit, with Jasmin Glaesser of Team BC winning the women's title and Remi Pelletier Roy of Equipe de Quebec the men's. 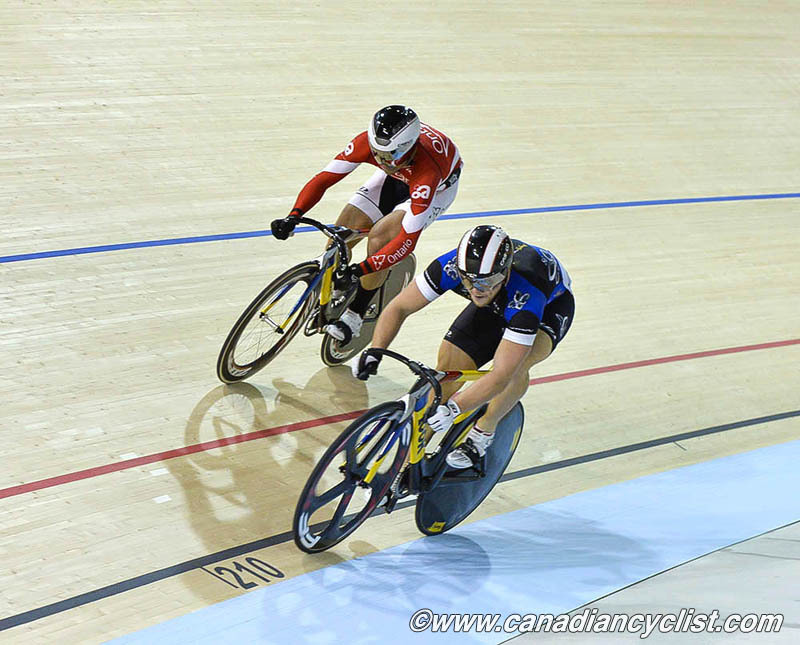 Both of the sprint competitions saw aggressive racing on the new 250 metre track which will play host to the Pan Am Games later this year. Sullivan and her team mate Kate O'Brien, who combined to take the Team Sprint title on Day 1, worked their way through the heats to meet in the Final. While O'Brien tried to win from both the back and the front, Sullivan was clearly stronger, powering by her rival to win the title in two straight rides. 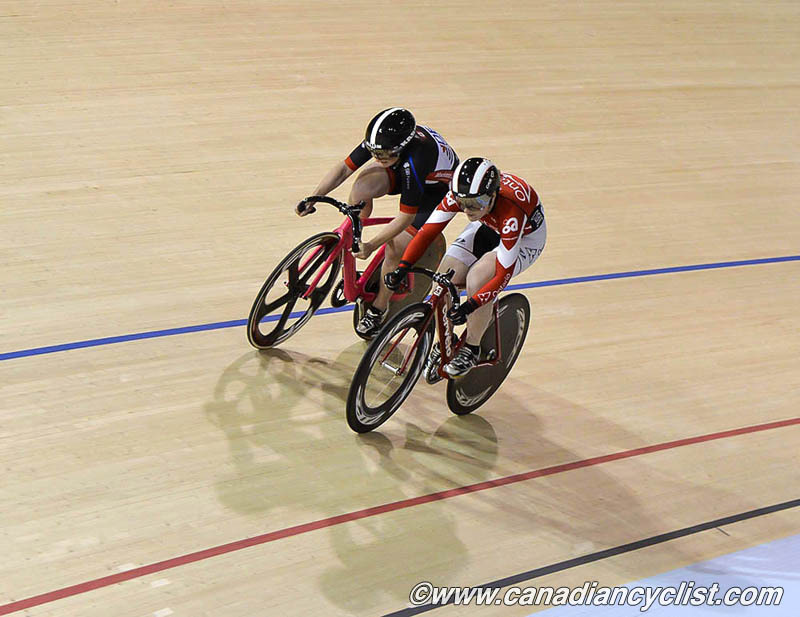 An impressive newcomer, Lizanne Wilmot (Team NCCH p/b DEC), overcame defending champion Candice Vermeulen (Team Ontario) in the quarterfinals, and took the bronze medal. Kate's speed is really good," explained Sullivan, "but her speed is not as snappy as mine, so I just tried to take advantage of my speed. I wanted to get a gap on her and stay away. We are sharing a room here, and we know each others tactics, so it was just about executing the ride." 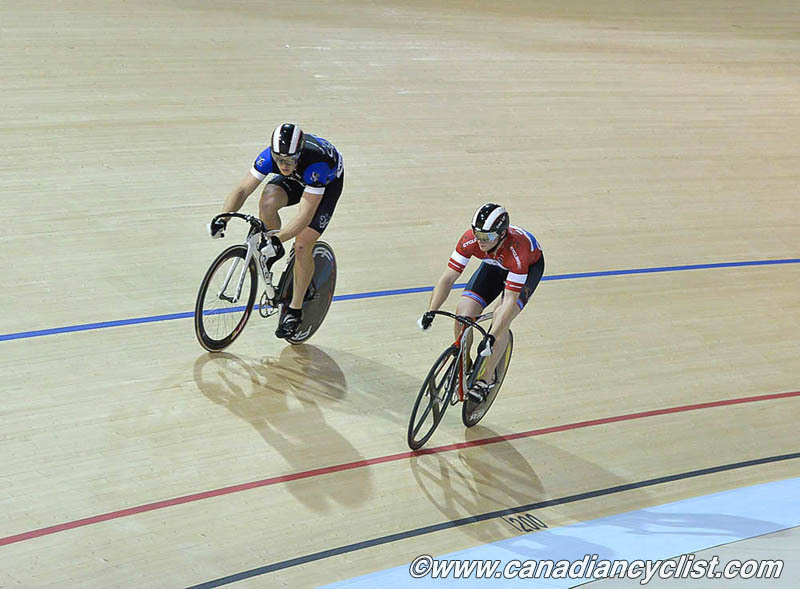 The men's competition was always expected to come to a showdown between Barrette and Joseph Veloce (Team Ontario), Canada's top sprinters on the World Cup circuit. Barrette took the first ride in the final, by a tiny two-thousandths of a second, but Veloce came back to even it up in the second ride. The third deciding ride saw Barrette dictate the pace, gradually ramping up the speed each lap. Veloce tried to come by on the last lap, but Barrette held him off to take the title. Evan Carey (Team BC) took the bronze medal. "I had a rough start to the day," commented Barrette, "I felt a little flat. I'm coming back from illness and on the road to recovery. I had really good legs in the final. It's a new track and we are still learning how to ride it, which includes some misses, sometimes. I mismanaged the second ride, but I wanted to come back strong, and I got it done in the third ride." The Individual Pursuit was part of the Omnium competition, but also a stand alone national championship. In the women's competition, Annie Foreman McKay (The Cyclery-Opus) set a very fast early time of 3:42.885 for 3000 metres. Her time held up until the final four riders, when Glaesser took over four seconds off to record 3:38.378 for gold. 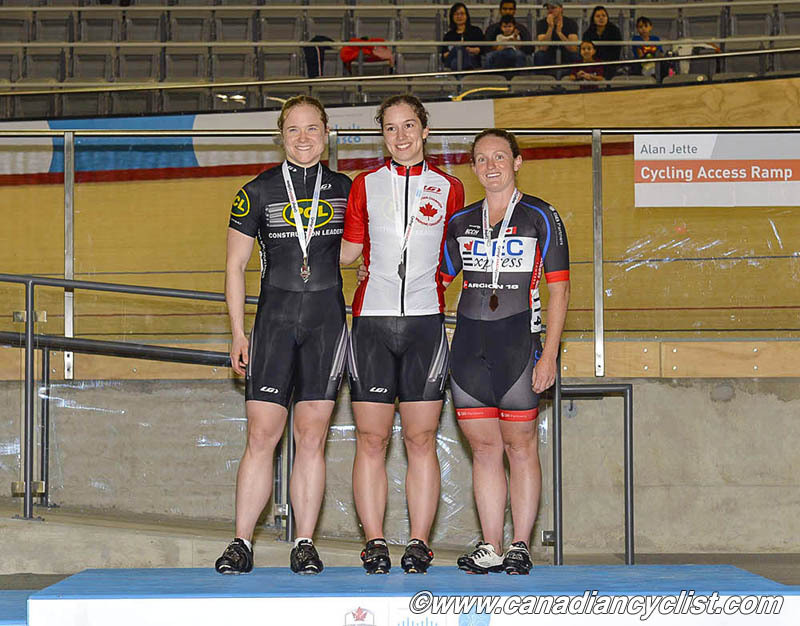 Allison Beveridge (Trek Red Truck) took the bronze. "Making it two for two, in two days, is pretty exciting," said Glaesser. "it's a good sign of where I'm at heading into the world championships, so definitely looking forward to the rest of these championships and the six weeks of training leading into the world championships. Today it was mentally tough, travelling from the west coast, and coming to the snow, and the cold ... I just had to put it together in my head and have the best ride I could." 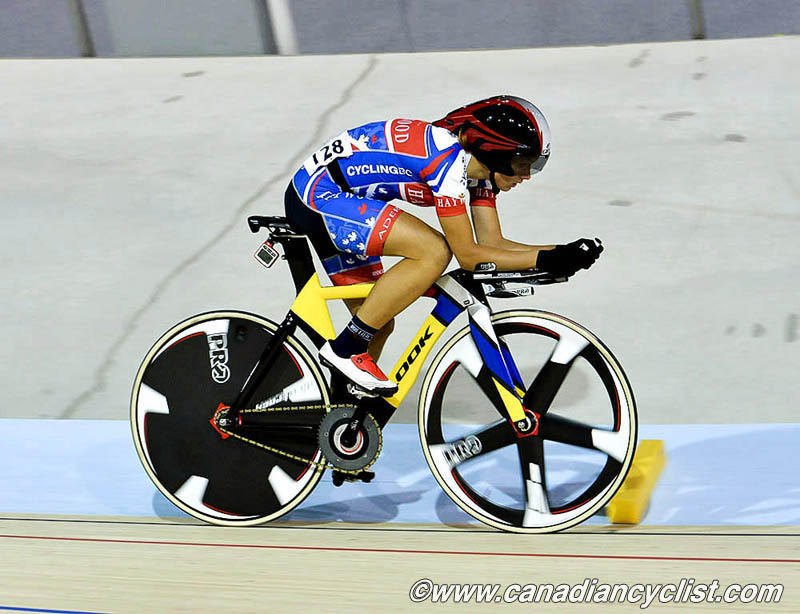 In the men's Individual Pursuit, road pro Ryan Roth (Silber Pro Racing) set the early fast time of 4:35.658 for 4000 metres, which held up through rider after rider, until Pelletier Roy knocked nearly two seconds off to record 4:33.815 and take the gold medal. Ed Veal (Real Deal Racing) took bronze. "I think I had a good ride, but a bit slower than I expected," admitted Pelletier Roy. "I was aiming for 4:32 today, and 4:28 earlier in the week, but a 4:33, considering it is the third event in the day ... I'm really happy with the result. I'm aiming for the Omnium overall, but it's really nice to get the Team Pursuit yesterday and the Individual today. So tomorrow if I can bring home the Omnium title it will be a perfect weekend." In the Omnium competition, after three of six events, Beveridge leads with 114 points, two points in front of Glaesser. Veal leads the men's competition with 110 points, six points ahead of Pelletier Roy. Two other events were worthy of note: past world champion Gord Singleton took bronze in the men's Master C Sprint competition, and Tour de France star Steve Bauer won the Master C men's Time Trial title, his first national title since 1983. Competition continues tomorrow and concludes on Tuesday.